Get ready to hunt down pots of gold in the Celtic Vegas pokies game with 25 paylines over 5 reels. You will find bright and colorful Irish themed symbols such as Leprechauns, pots of gold and beautiful Irish lasses. What makes this game so special is it has a double feature, both a free spins mode and a Pick Me feature where payouts and prizes are big! You can discover the ancient Celtic secrets when you play Irish Eyes. The Leprechaun Wild symbol substitutes for all other symbols except scatter and is key to spinning up some big paying combinations. The Leprechaun Pick Me is won when the Leprechaun appears on reels 1 and 5 on the same spin. This provides an instant cash bonus up to 100x original bet by picking one of the Leprechauns. Look out for the Irish Lass scatter symbol because 3 or more trigger the rewarding free spin feature. Here you win 12 free spins with more free spins triggered with additional scatters. This really is a slot similar to what is found in Australian casinos. 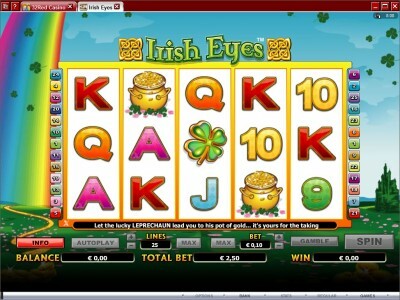 It is very important when playing Irish Eyes pokies to look for the lucky Leprechaun, as well as the Irish Lass. These symbols are your chance to winning a big pot of gold! This pokie really does provide stunning graphics, smooth animation and fun sounds. Available on mobile and PC computer online casinos.